Praiano is a town and comune of the province of Salerno in the Campania region of southwest Italy. You'll explore the less-touristy side of things at Wine Tours & Tastings and Valle delle Ferriere. 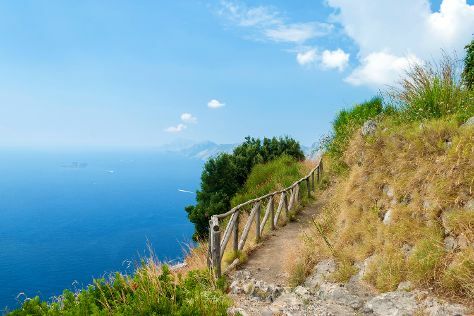 Explore the numerous day-trip ideas around Praiano: Ravello (Villa Cimbrone Gardens, Villa Rufolo, & more) and Amalfi (Museo della Carta, Duomo di Sant'Andrea, & more). And it doesn't end there: take in the pleasant sights at Sentiero degli dei (Path of the Gods), kick back and relax at Fornillo, and head outdoors with I Suoni degli Dei - Pelagos. For maps, traveler tips, where to stay, and other tourist information, use the Praiano journey website . If you are flying in from United States, the closest major airport is Naples International Airport. In June, daily temperatures in Praiano can reach 82°F, while at night they dip to 68°F. Wrap up your sightseeing on the 29th (Sat) early enough to travel back home.